This article was originally published by The Science of Eating. Did you know that your fingernails can provide clues to your overall health? Normal, healthy nails should appear smooth and have consistent coloring, but as you age, you may develop vertical ridges, or your nails may be a bit more brittle. This is harmless and nothing to worry about. If you notice spots due to injury on your nails, this should grow out with the nail and not turn into a big deal. Abnormalities that occur on the nails may warrant a closer look. These oddities such as spots, discoloration, and nail separation can be the telltale sign of viral warts, infections, and some medications, such as those used for chemotherapy. If the nails are mostly white with darker rims, this can indicate liver problems, such as hepatitis. In the image below, you can see the fingers also appear yellowish in color meaning they are jaundiced, which is another sign of liver trouble. If small white dots that appear on the surface of the nail that won’t budge when you try to buff them off, this is usually due to some type of trauma—even something as simple as a banged finger or a too-aggressive cuticle trim. In this case, give them some time to grow out and fade, but if they don’t go away, see your dermatologist, as it could be the signs of other health issues such as Leukonychia. Commonly called white nails or milk spots, and is more frequently located on fingernails compared to toenails and often can be found in the central portion of the nail plate. The normal nail beds needs to be pink in color showing good blood flow underneath the nail plate. These white spots usually are completely benign, although in some other situations it could be an indication of an underlying disease. Bacterial or perhaps fungal infection on the nails could potentially cause, or an unusual side effect of systemic chemotherapy. This can be found in people with arsenic poisoning, kidney failure, respiratory condition. Contact with extreme cold could possibly result in progression of leukonychia, but these spots will slowly vanish over time. With yellow nail syndrome, nails thicken and new growth slows. This results in a yellowish discoloration of the nails. One of the most common causes of yellow nails is a fungal infection. As the infection worsens, the nail bed may retract, and nails may thicken, crumble, lack a cuticle and detach from the nail bed in places. The medical term of Blue fingernails is cyanosis, and can be a sign of various disorders so it should be checked out. While very cold temperatures can temporarily slow the flow of blood through the skin leading to a bluish color, this should go away once you warm up. In Raynaud’s disease the fingers and toes blanch, then turn blue and may become numb or painful when exposed to cold. The problem is simply over-sensitivity of nerves controlling blood flow through small arteries in the fingers, toes, nose and earlobes. This odd coloration can also be due to low hemoglobin, which carries the oxygen in red blood cells. Normally, blood is bright red due to the oxygen it contains, but when oxygen levels decline, blood turns a blue-red color. This chronic cyanosis can be a sign of many different lung and breathing issues like asthma, emphysema, chronic obstructive pulmonary disease, chronic bronchitis and other respiratory disorders. It also can be a sign of a number of heart problems, a response to high altitude or an overdose of certain drugs such as narcotics, benzodiazepines, and some sedatives. Green nails are the result of a pseudomonal infection, which is usually caused by the environment. This means that those who’s immune system is already low are very susceptible to this type of nail infection which makes the nail often appears green in color. 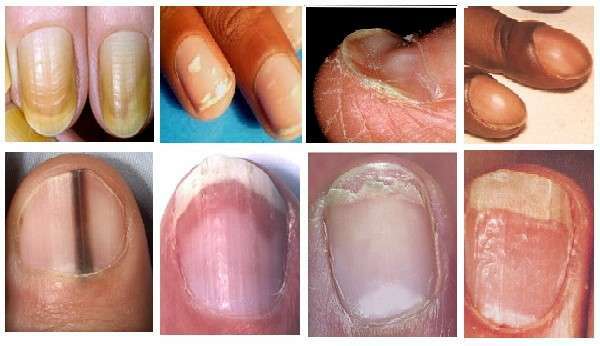 Small hole or ice pick-like depressions in the nails (nail pitting) are common in people who have psoriasis, which is a condition characterized by scaly patches on the skin. Nail pitting can also be related to connective tissue disorders, such as Reiter’s syndrome, and alopecia areata — an autoimmune disease that causes hair loss. If the nail surface is rippled a lot like the pitting I discussed above, and this may also be an early sign of psoriasis or inflammatory arthritis. Discoloration of the nail is also common, as the skin under the nail can seem reddish-brown. Cracked or split nail is one of the common yet disease related nail disorders. Dry, brittle nails that frequently crack or split have been linked to thyroid disease. Cracking or splitting combined with a yellowish hue is more likely due to a fungal infection. Low levels of Vitamin C, folic acid, and certain proteins in the diet are also known to cause nail splitting. These can either be horizontal or vertical. With vertical nail ridges, this can signify nutrition issues, moisture loss or nutritional absorption issues. Horizontal ridges in the nail are often associated with diabetes, liver diseases or other chronic diseases. Either type of ridges can also be caused by damage to the nails. If you have dark skin, it’s fairly common to have streaks of the pigment melanin down your fingernails. However, you should still get this checked by a doctor, as it may occasionally indicate a form of skin cancer called subungual melanoma, the most dangerous type of skin cancer. Generally this only affects one nail, causing the stripe to change in appearance, and becoming wider or darker over time. The pigmentation may also affect the surrounding skin. These are thin dark lines under the fingernail that could be from mean tiny vessels under the nail that are bleeding. These are known as “splinter hemorrhages,” and are nothing to worry about if they are due to the nail being injured. However, if a few nails are affected, this may be a sign that one of the heart valves is infected, known as “endocarditis”. Splinter haemorrhages can also be associated with several other conditions, such as scleroderma, lupus, psoriasis and rheumatoid arthritis. This appears as vertical beaded ridges resembling a candle’s wax drippings. With nail beading, the beads seem to drip down the nail like wax, and it is associated with endocrine conditions, like diabetes mellitus, thyroid disorders, Addison’s disease, Vitamin B deficiency, hormonal changes, or stress. However, just like with our skin, these “wrinkles of the nail” are usually caused by ageing. They run from the nail bed to the tip and generally start on one or two nails. Over time, the ridges can appear on all nails. Gentle filing and buffing can help to smooth them. Clubbing of the fingertips can run in families and could be harmless. However, if it suddenly develops, it may be a sign of an underlying medical condition, and due to low oxygen levels in the blood, resulting in various diseases such as lung or heart disease. With clubbed fingertips, this natural angle is gone and the nails are in line with the top of the fingers. Hamman-Rich syndrome, or acute interstitial pneumonitis, (a form of pneumonia) characterized by inflammation of the lung. With advanced interstitial lung diseases, digital clubbing and signs of heart failure may appear. It is also associated with inflammatory bowel disease, cardiovascular disease, liver disease and AIDS. This was named for Dr. Richard Terry and is when the fingernails and/or toenails appear white with a characteristic “ground glass” appearance, with no lunula, or the white crescent-shaped area of a finger nail. With the condition known as Terry’s nails, most of the nails appear white except for a narrow pink band at the tip. It is described as a brown arc near the ends of the nails. Terry’s nails can sometimes be attributed to aging. In other cases, Terry’s nails can be a sign of a serious underlying condition. This condition could be due to a decrease in vascularity and an increase in connective tissue within the nail bed, and frequently occurs in the setting of liver failure, cirrhosis, kidney failure, diabetes mellitus, congestive heart failure, hyperthyroidism, and/or malnutrition. This is the presence of longitudinal striations or ridges on the nail plate, can simply be a sign of advanced age, but it may also be associated with conditions such as rheumatoid arthritis, peripheral vascular disease, lichen planus, and Darier disease (broad white and red striations in the nails). A central vertical ridge or groove (shown) may be due to myxoid cysts that appear near the nail fold, which are associated with osteoarthritis. Onychorrhexis nail disorder mainly affects people who suffer from disorders. Malnutrition or poor nutrition can affect the health and growth of nails and make them brittle, while trauma or injury to the nails can also result in Onychorrhexis. Repeated injuries to the nail are often seen to give rise to this condition. Those who work for long hours with soap and water are also at risk from this disease, as are those who use too much nail polish remover, along with those who are subjected to prolonged exposure to cold. Hypothyroidism is a glandular disorder results from a deficiency of thyroid hormone production. Reduced thyroid production happens due to a hypoactive thyroid gland. It is one of the major causes of Onychorrhexis. Bulimia is a condition affects young women who get depressed after eating in excess and feel guilty about not controlling their diet and keeping a check on their weight. Anorexia Nervosa is another psychological disease in which the sufferer is obsessed with his or her body weight and has a delusion of being too fat despite being emaciated. The diagnosis of Onychorrhexis is not complicated, as the disease is detected mainly by physical observation of the nails. Blood tests and thyroid level examinations may be recommended if the doctor suspects underlying conditions like Hypothyroidism. The medical treatment of Onychorrhexis generally depends on the underlying condition. Treatment is supposed to vary with the nature of disease behind the appearance of Onychorrhexis. Once the causative condition is treated, the Onychorrhexis symptoms will also disappear in a short while. The treatment of Onychorrhexis at home involves medications like hand creams. Using a cream or lotion consisting of natural plant oils will keep the hand moist and help cure the disease. Regular application of moisturizers on the skin and nails will ensure that the symptoms do not recur. B eau’s Lines are indentations that run across the nails, and can appear when growth at the area under the cuticle, and this phenomenon was originally described in 1846 by the French physician Joseph Honoré Simon Beau. The lines are caused by diseases that affect the entire body, including malnutrition, heart attack, liver diseases, severe infections like mumps, measles, scarlet fever, pneumonia and metabolic disturbances, such as poorly controlled diabetes. However, Beau’s lines can result from any disease process or illness that is severe enough to affect the growth plate of the nail. Malnutrition and chemotherapy drugs for cancer can also cause Beau’s lines, as can a zinc deficiency. Trauma or injury may also be a cause of Beau’s lines or nail ridges. The timing of the disease can be estimated by measuring the distance from the Beau’s line to the nail bed. Spoon nails (koilonychia) are soft nails that look scooped out. The depression usually is large enough to hold a drop of liquid. Often, spoon nails are a sign of iron deficiency anemia or a liver condition known as hemochromatosis, in which your body absorbs too much iron from the food you eat. Spoon nails can also be associated with heart disease and hypothyroidism. With a condition known as onycholysis, the fingernails become loose and can separate from the nail bed. The separated part of the nail becomes opaque with a white, yellow or green tinge. Sometimes detached nails are associated with injury or infection, but in other cases nail separation is a reaction to a particular drug or consumer product, such as nail hardeners or adhesives. Thyroid disease and psoriasis also can cause nail separation. Paronychia is the name for inflammation that causes a painful, red and swollen nail fold, or the skin and soft tissue that surrounds and supports the nail. Paronychia can be acute, where it develops over a few hours, or chronic, where it lasts more than six weeks, and is most often caused by infection, injury or irritation. Sometimes, there’s an underlying skin condition such as eczema or psoriasis or another medical condition such as diabetes or HIV, and is about three times more common in women than in men. Biting your nails may be nothing more than an old habit, but in some cases it’s a sign of persistent anxiety that could benefit from treatment. Nail biting or picking has also been linked to obsessive-compulsive disorder, and the habit is often a way to ease anxiety or to keep at least one part of the body occupied while the mind lacks interest. Frustration and loneliness are additional emotional triggers that can lead to nail biting. While some research suggests genes may play a role, if you can’t stop, it’s worth discussing with your doctor.